Home › For sale › Belgium› Bed and Breakfast › B&B, Holiday Home "De Muur", On Flanders Most Iconic Hill. For sale: B&B, Holiday home "De Muur", on Flanders most iconic hill. B&B, Holiday home "De Muur", located in Geraardsbergen, pearl of the Flemish Ardennes. 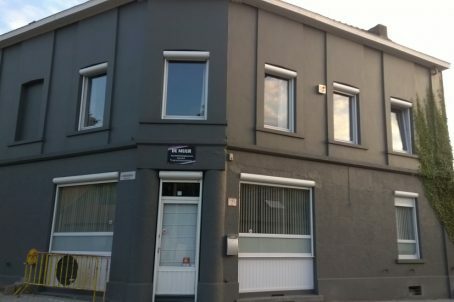 Unique investment property at 200m from the top of the iconic "Wall of Geraardsbergen". Suitable for 16 people, with south-west facing garden & large parking lot on a site of 11are33ca. Ready to move in and currently still operational. Proven turnover and with already different reservations in the future. Unique holiday home, B&B completely furnished for 16 people with south facing garden at the famous "Muur van Geraardsbergen"
There is a large private parking for at least 6 cars on a site of 11are33. On the ground floor a dining and living room with wood fire, a fully equipped kitchen, blue stone floors, spacious veranda, bathroom and storage, large south-west facing terrace with jacuzzi and sauna, fully enclosed garden. On the first floor there are 3 bedrooms, 2 with bathroom in the room & original antique (1885) wardrobes and wooden floor. On the second floor there are 2 bedrooms with shared bathroom and a large insulated attic of 50m². 2 cellars. CV on natural gas with high-efficiency boiler (including hot water), high-efficiency glass, electric shutters, central burglary & fire protection system. Ideal as a holiday home, B & B or private use! Already numerous reservations until 2020. Investment property with proven turnover 2017. Licensed holiday home approved by fire brigade and tourism Flanders! Property for sale at 330,000 €. Trading fund (full contents, current reservations, website, customer base .....) price to discuss. Trading fund is free of registration fees and fully deductible. All exploitation licenses, three star residence recognized by Tourism Flanders. info via: [email protected], 0494 42 85 68.